When sticking a magnet to something, should the magnet attract to a piece of steel or to another magnet? It’s a great question that we hear quite often. As always, the answer depends on what you’re trying to accomplish. In this article, we’ll discuss the pros and cons of each method. Why would you want to use a magnet attracting to a piece of steel rather than two magnets? The biggest motivation is reduced cost. A piece of steel is less expensive than a second magnet. If you can get the same results for less cost, why wouldn’t you? It turns out the answer isn’t so simple. The cost savings aren't always so clear. Let’s look at a few rules-of-thumb we’ve learned by measuring the strength of so many magnets. If the steel is big, magnet-to-steel is the same as magnet-to-magnet. With a large steel surface, the pull force from a magnet to the steel is about the same as the pull force to a second, identical magnet. When touching, a magnet sticking to a big, thick steel plate requires about the same amount of force to pull the magnet straight away from the steel plate (Pull Force, Case 1) as it would to pull the magnet straight away from a second, identical magnet (Pull Force, Case 3). If your steel surface is large and thick enough, the force is the same. If the steel surface is too thin, the force to the steel might be less. 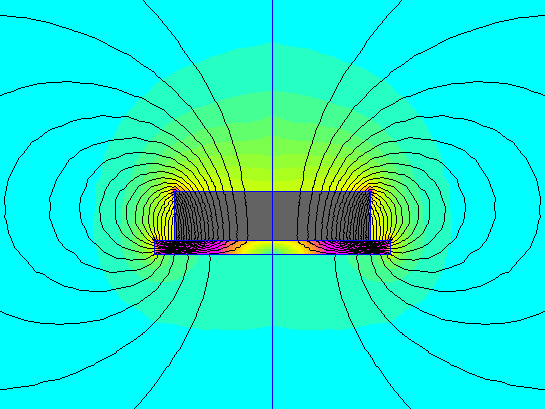 If the steel isn't substantially larger than the magnet, the force might be less. If your steel isn’t quite so big and thick, it’s possible that you’ll see less force with the magnet-to-steel setup. We find that the steel part should be at least a little bit larger than the magnet size. If you’re using a ½” x ½” magnet like the B882 block, then you might want the steel plate to be something like ¾” x ¾” in size. The thickness of the steel piece also matters. For that B882 block magnet, anything thinner than about 0.055” thick will result in less force. You can estimate this minimum desired thickness using our online Steel Thickness Calculator. If there's a gap between the magnet and the thing it's sticking to, the magnet-to-steel might be weaker than the magnet-to-magnet. If there’s a gap between the magnet and the thing you’re sticking it to, the magnet-to-magnet setup will provide more force than the magnet-to-steel. You can experiment with this using our online Pull Force Calculator. That B882 block magnet will stick to a big, thick steel plate with about 7.34 lb of force. It will also stick to another B882 magnet with the same amount of force. If you have a gap between the magnet and what you’re sticking it to, however, the force decreases more for the magnet-to-steel. If I stack 20 pieces of paper between the magnet and what its sticking to, I’ve introduced about a 1/16” gap. The magnet-to-magnet setup might pull with 3 lb of force, compared to 2.3 lb with the magnet-to-steel. The Pull Force Calculator screenshot below shows how, for distances greater than zero, the magnet-to-magnet pull force can be greater than the magnet-to-steel. 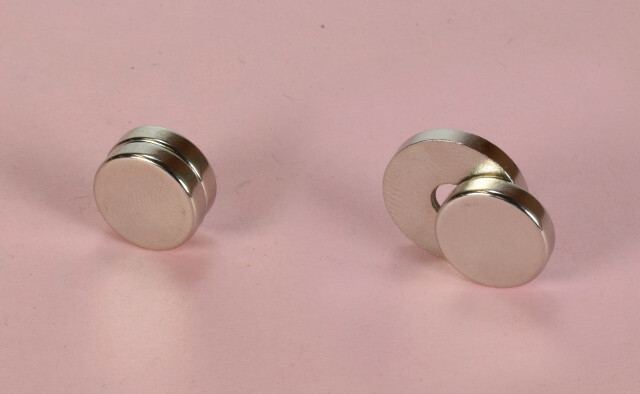 Two magnets (left) pull to center upon one another, while a magnet and a steel disc (right) can stick together offset. There’s another difference you’ll want to think about that isn’t described in pull force numbers or tallying the cost. When you stick two magnets together, the pull force attracting one to the other isn’t the only thing going on. There are also lateral forces and torques that act to pull the magnets to center upon one another. If you’re using Sewing Magnets to make cool buttons on a shirt, this is a perfect way for them to behave. Our Magnetic Forces article has some great, hands-on examples of the forces you might see with a magnet-to-magnet setup. With magnet-to-steel setups, you don’t get this same “centering” force. In fact, a magnet will happily sit just about anywhere on a larger piece of steel. They won’t pull to center on one another. This is great if you’re making a magnetic cabinet latch, where the position of the cabinet door might vary a bit. With the steel strike plate that’s larger than the magnet, the force feels the same despite minor positional changes. In that cabinet latch example, a magnet-to-magnet setup might even perform worse. When misaligned, you don’t get nearly as much force. Mis-align two magnets enough, and you’ll start to see repelling forces! Which method you choose depends on how you want them to behave. Are centering forces good? 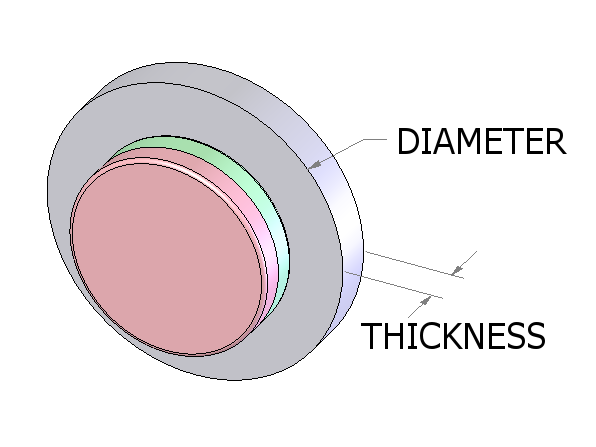 Here’s the scenario: Let’s imagine we’re using a ½” diameter x 1/8” thick D82 magnet to hold a badge on a shirt. 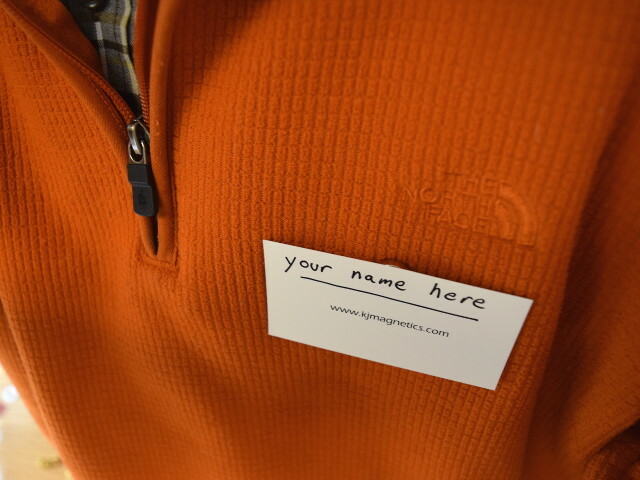 Glue one magnet to the backside of the name badge. Place either another D82 magnet or a chunk of steel inside the shirt pocket. Which is the better solution? The thin cotton shirt I’m wearing has a material thickness of about 0.012”. 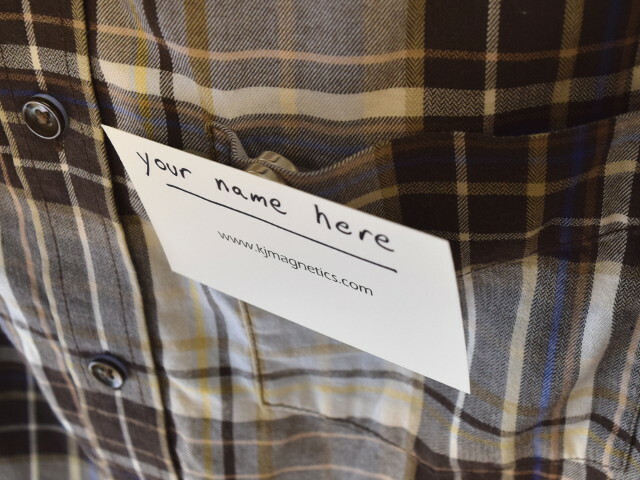 With the badge’s magnet on the outside of the pocket and the magnet or chunk of steel on the inside, the magnets are attracting towards each other across that 0.012” distance. How does this affect the strength? According to the calculator, the magnet-to-magnet setup (Pull Force, Case 3) is about 10% stronger at 4.76 lb vs. 4.31 lb. In practice, because my steel disc isn’t too large, the magnet-to-steel might actually be a bit weaker still. Let's say the magnet-to-magnet is 10-15% stronger. A single D82 magnet is $0.99. We don’t sell steel strike plates, but let’s say you used an NSW82 ($0.45) steel washer. The two-magnet solution is more expensive, at 2 x $0.99 = $1.98. The magnet-to-steel method at $0.99 + $0.45 = $1.44. The magnet-to-steel is the winner if cost is the only factor. I might still pick the magnet-to-magnet setup because I like how they pull to center on one another. Let’s solve the same problem again, but this time we’ll stick the name badge through a warm fleece jacket. It measures about 0.04” thick, so the magnet has a larger gap to reach across. Here, the magnet-to-magnet setup is more like 25% stronger. To make a fair comparison of strength vs. cost, we have to compare two solutions that have the same strength. We can do that with a larger magnet or a magnet in a higher grade. If we change to the grade N52 D82-N52 magnet, it works out that the strength is comparable to the two-magnet solution. The calculator says it’s 3.13 lb. Again, the magnet-to-steel solution costs less, but not quite half. The good examples here are a great way to understand the ideas behind what magnets will do, but they might not completely answer your questions. If you’re in doubt, get a few magnets in your hands to experiment with what feels best. A bit of experimentation to find the right feel can often be the fastest, best way to find the right solution. Study pull force of a D82 disc magnet sticking to a steel disc with different diameter and thickness dimensions. We mentioned that in a magnet-to-steel scenario, both the thickness of the plate and the size of the plate can change the pull force. 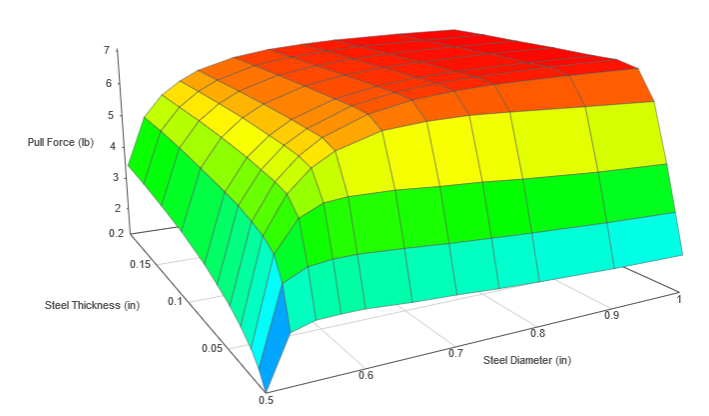 While our online Steel Thickness Calculator can provide specific estimates about how steel thickness affects pull force, it only considers very large steel surfaces. It assumes the steel is way bigger than the magnet. What if you’re faced with a situation where the steel is both thin and small? How much force can you expect then? It turns out that the two factors are somewhat interrelated. In the data presented below, we’ve considered the theoretical pull force of a simple D82 disc magnet to a steel disc of varying dimensions. The table below shows the percentage of pull force you might expect, as a fraction of what's possible with a very large steel disc. Important note: We generated this data using computer analysis (FEA), and did not back it up with experimental measurements to check it thoroughly. The numbers are probably pretty accurate, but consider them theoretical and unconfirmed.